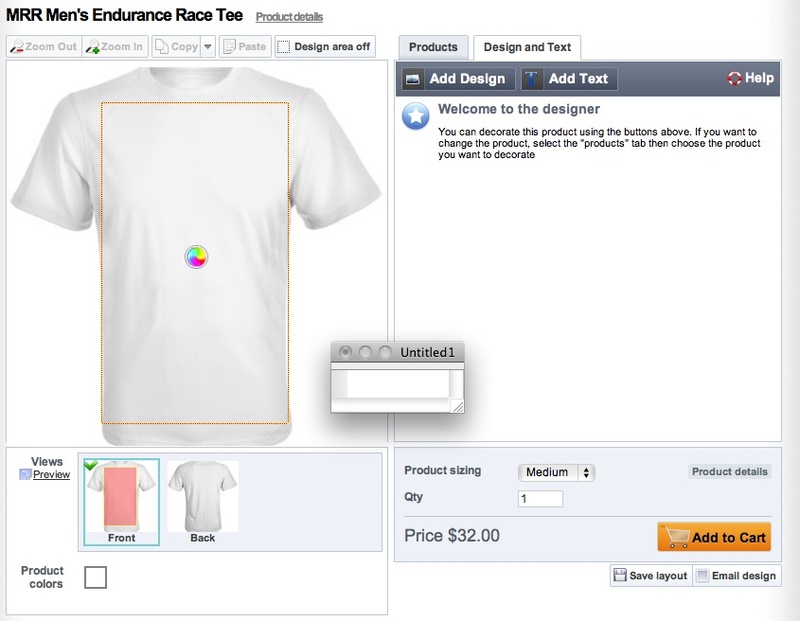 MyRaceRagz is a website that allows you to make a custom racing shirt for your races. First, you go onto their website located at www.myraceragz.com and simply click on "Create your Shirt Now" Once you do that, it will bring you a TON of suggestions and also allow you to pick the shirt that you want. They have long sleeve, short sleeve, singlets, and race tanks. And one really important thing for the women out there, they have specific sizes for woman and men so that you can get the proper fit. I decided to order the Men's Endurance Race Tee in short sleeve. The only choice for shirt color is white because of the special process they have to go to in order to die the shirt. Once you have clicked on your shirt, it shows a picture of the front and the back. For the same price you get to customize BOTH the front and the back with anything that you want. This means you can put one of the many graphics that they have, you can send them a picture of your own, and you can also write anything you want on the shirt. As you can see, you can "add design" which allows you to look through the hundreds of designs. It took me quite some time to decide what I wanted to add but it was fun looking at everything they offered. In addition, you can "add text" and type something on the shirt. You can change the size of both the graphic and the text and custom fit it where you want it on the shirt. 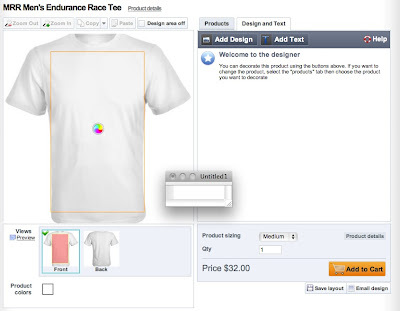 The site also gives you a little gage to make sure that what you are putting on the shirt will look good when printed. Great idea because who wants a shirt that does not look good in the end. Once you have completed both the front and back, you checkout and pay for it and that's it! They say shipping takes 7-10 days and manufacturing of the shirt takes 4-6 days but I received my shirt in 10 days total. A very quick turn around. The other nice thing is that you can only order one shirt. There are no minimums so everyone can make one. While there are hundreds of reason why you might want to order a custom shirt, I would think running your first marathon would be a great reason. Or...are you running in memory for someone? This is the way to go to share with everyone why you are running. Or perhaps you are doing a relay and want everyone to have custom shirts? The quality of the shirt itself is of excellent quality. It would be very similar to many of the tech race shirts you receive at a race. The process they use to put the message/graphic on the shirt is great because you cannot even tell it's there. There is no effect to the shirt except that your graphic is there. What I'm saying is that you cannot feel anything on the shirt when you are running. To me, this is especially important because I don't want to race in a shirt that is rubbing me the wrong way and causing chafing. 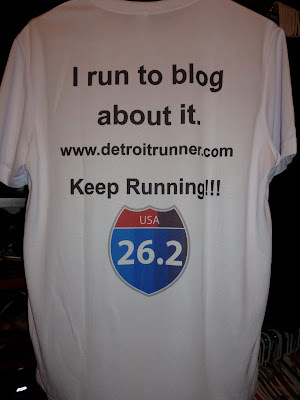 To determine this I tested out wearing the shirt for my half marathon yesterday. The result? I never even noticed it. I also had one runner ask me about the shirt as well so people were reading it. By the way, sizing is true to size - The medium I ordered fit perfectly! Here a picture of the shirt I made. I put a little humor on the front(their design) and was also able to fit my blog on the front as well. On the back I put my own comments along with my blog and added another design(theirs) to the back too. I think it turned out great and I felt like everyone at my race yesterday was looking at the shirt. Here's a cool little sticker that also came with my shirt. It's about the size of one of those 26.2 stickers you see on peoples cars. Overall, I think that all of you would really love the shirt and the excellent quality that it comes with. 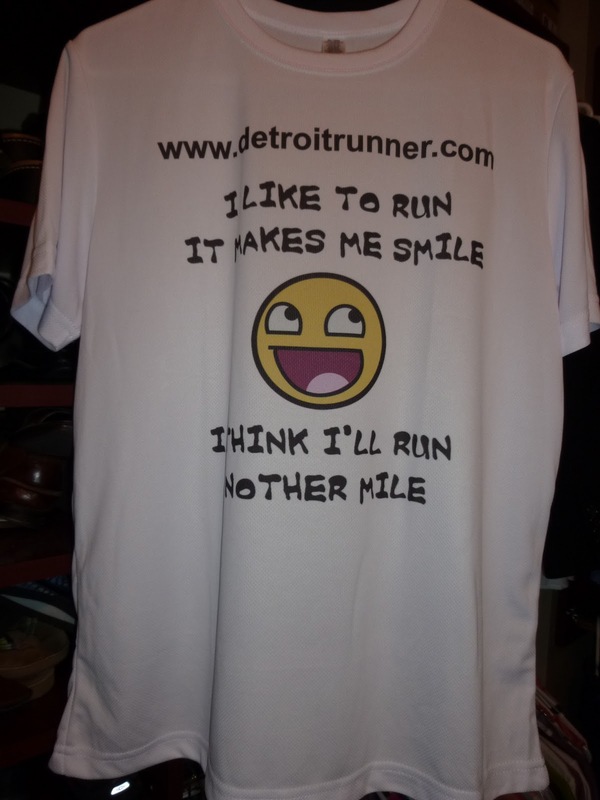 What better way to run your next race than with a custom shirt from MyRaceRagz! I can assure you the next time I want a custom shirt for a race, I will be making my order with MyRaceRags. Interested in even more information about MyRaceRagz? * I was sent a coupon to purchase a custom race shirt in exchange for a review of their product. All opinions expressed in this review are my own and I was not required to give a favorable review. Going to their site now. How is the sizing? Sizing is true to size - Medium is what I wear and it fit perfectly. I added this to my review. Thanks Jamoosh! i love what you put on your shirt! so clever! I love it!! I've been looking at the custom shirts sites and have yet to find one that will seem viable for cost. I'll have to check them out! Michel - you will like them. Very reasonable prices for a fully custom shirt. XLMIC - Kevin was very nice to work with! Great company!